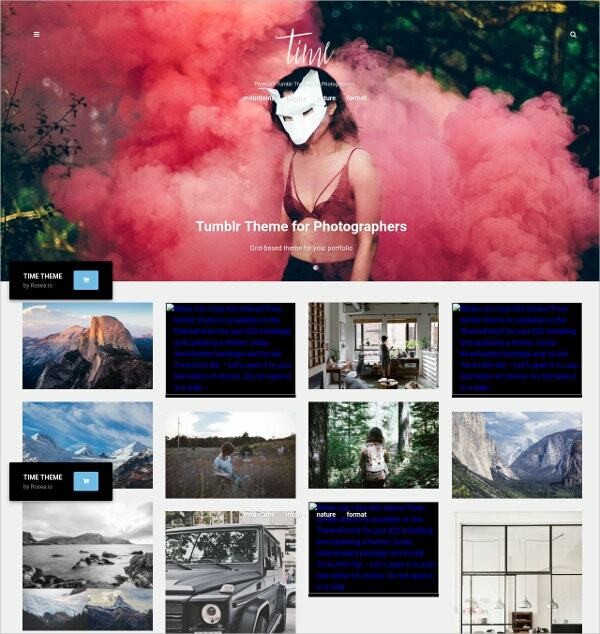 Tumblr makes a popular alternative to WordPress for professional photographers who want to showcase their work online. A number ofpremium and Free Tumblr Themes can give your site a professional look nearly as well as custom-built themes. The minimal dashboard and simple interface of Tumblr are enhanced with retina-ready, responsive layouts. Many themes offer Google analytics support, features like post filtering, comments sections, cross-browser support etc. 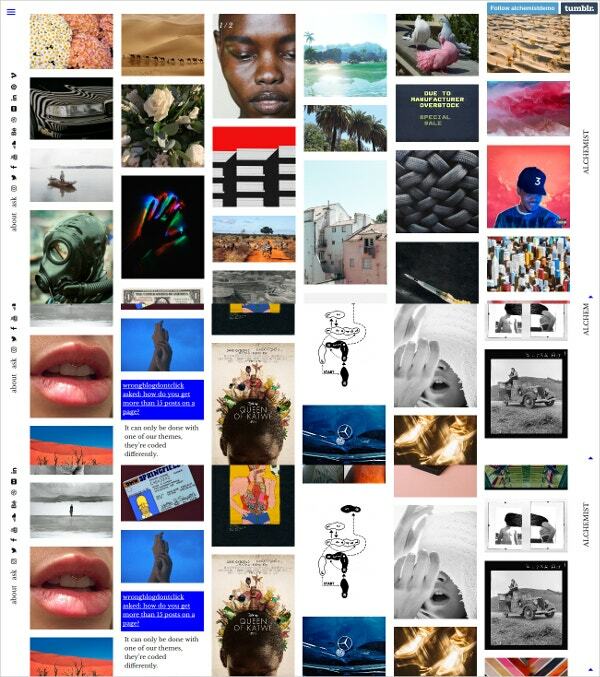 The following Tumblr themes are designed especially for photographers who want to create modern Tumblrs. 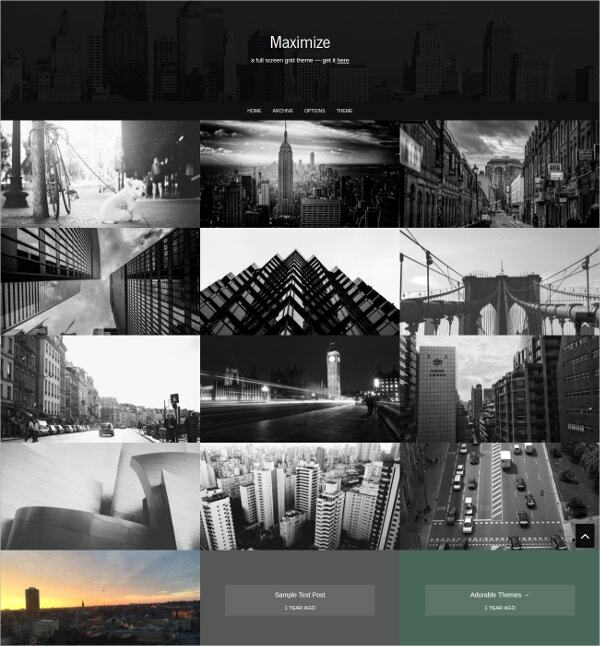 The Time theme uses a masonry grid layout that is well-suited for arranging different sized photos and other post types. It is of course responsive, as all modern themes should be. You can add infinite scrolling effects for a smooth viewer experience, use Google Analytics to monitor your Tumblr traffic and more. You may also see Vintage Tumblr Templates. Photoroll stands out with its minimalist design. 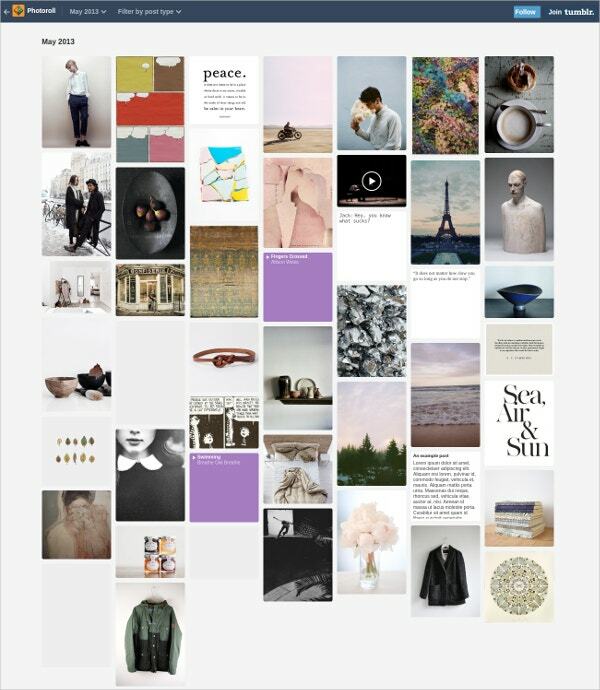 It lets you keep your Tumblr clutter-free and arrange high resolution images in a tiled format. It supports all post types and lets you add custom colors and custom images. You can also add tags to allow visitors to filter posts of a certain category. Tumblr usually has a boxed layout. 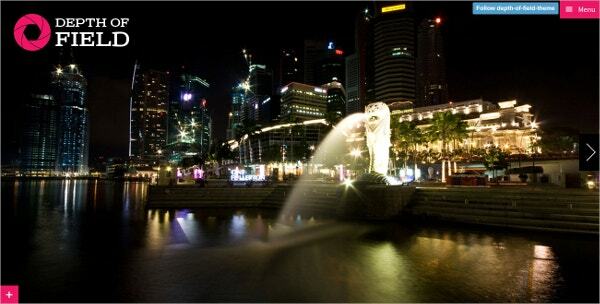 But the Depth of Field theme lets you go full screen with your photos and take the viewer’s breath away. You can post all Tumblr post types with this theme. The hidden sidebar lets you showcase Instagram photos, add social media links and more. Other features include Google web font library and Dribbble feed. 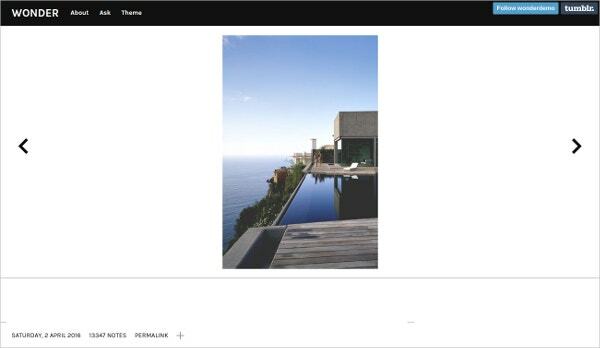 Maximize is also a grid theme but it is full-screen and comes with a lightbox feature where full-size photos and videos can be viewed without having to open a new page. The theme also supports post types like audio and text. The theme is responsive, lets you customize colors, add infinite scrolling and zooming on hover. You can also use Google Analytics with it. Modern themes with refreshing and bright colors like Luomo can be great fun for a certain kind of audience. The theme lets you completely customize your Tumblr background, change colors, customize text color, add social links and more. 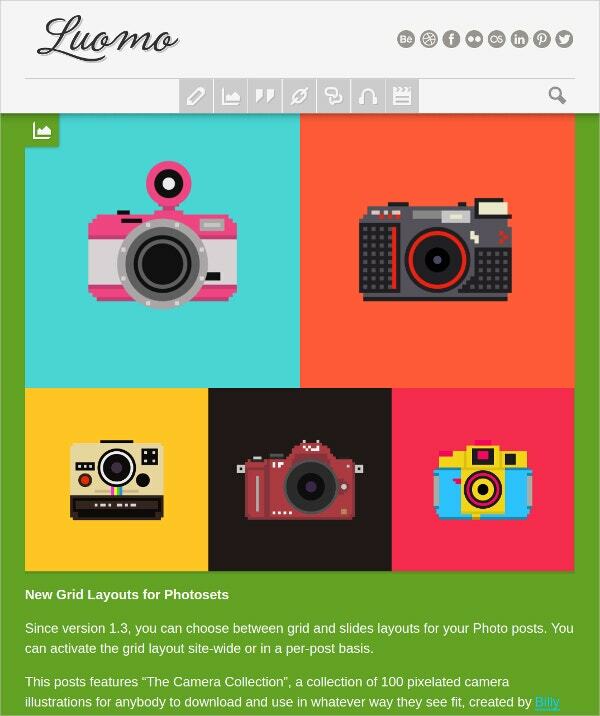 You can choose between slide and grid layouts for your photos. You can also activate the grid layout for the entire site or per post. Gapless grids can be just as attractive as grids using negative space, if the color palette is complementary. 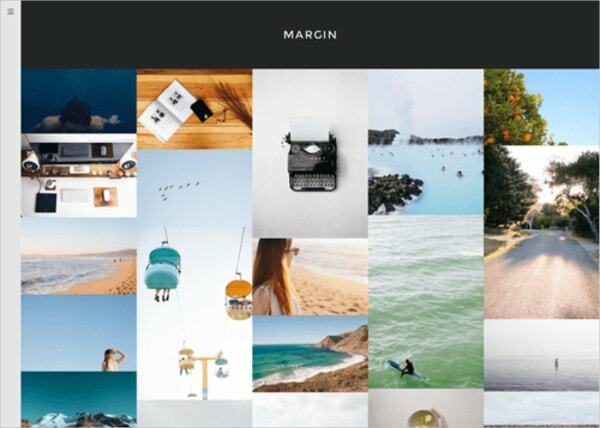 The beautiful and elegant Margin theme gives you a simple gapless grid system to showcase photos without any distractions. You can add features like post hover effects, masthead effects, toggle infinite scroll, add Twitter widgets, Disqus shortnames and more. 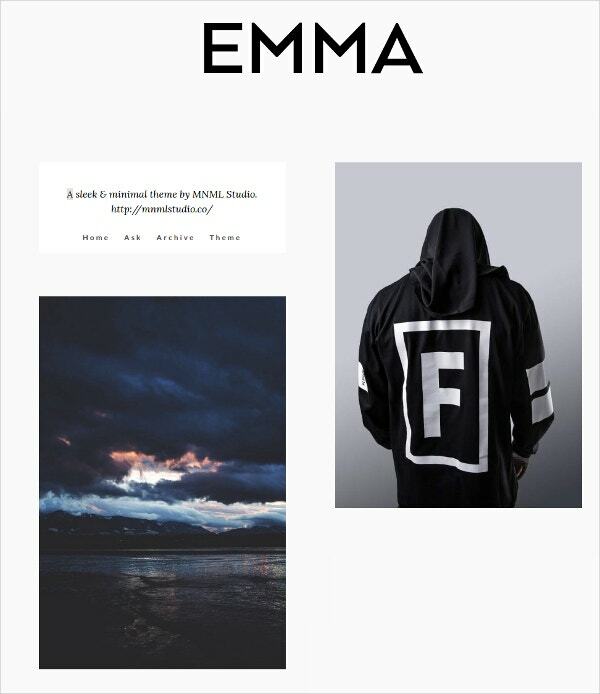 If you prefer lots of white spaces between your images, the high resolution theme Emma may be preferable. You can change colors, upload Logo images, use standard pagination or add more pagination, customize fonts, add social network links, Disqus comments and Google Analytics with the theme. It is sleek and minimal, ideal for modern responsive photography Tumblrs. 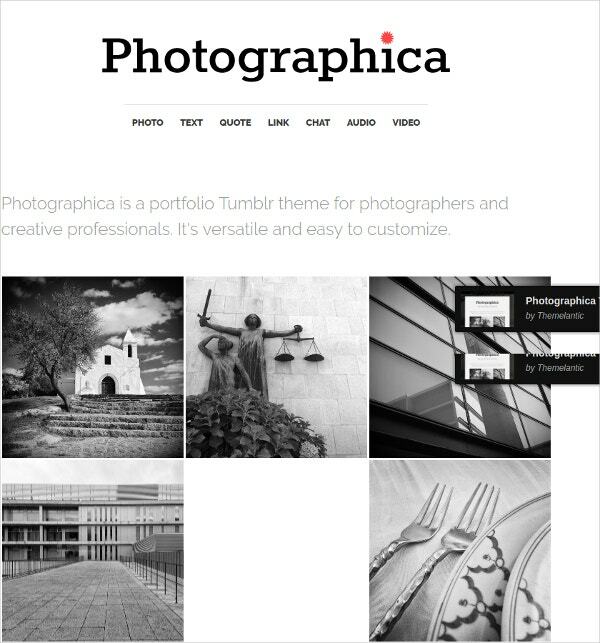 Photographica is a fantastic premium portfolio theme for creative professionals and photographers. It lets you add all post types in a grid system. The grids may be one-column, two-column or three-column depending on the size of the viewing device. The hover over effect that transforms to a text post is a great addition for photographers who have stories to tell about their work. Nitsef is yet another free and flexible Tumblr theme that you can use to not just showcase photos but also text posts, audio, quotes etc. It lets you customize colors and images, add Disqus comments and tags to a responsive, mobile-ready layout. It is a simple yet effective theme for most Tumblr users. Gallera is a gallery theme with classic grunge textured background and custom typography. It has romantic elements that makes the theme best suited for beautiful landscape photography and vintage photos though it can be adapted for other uses. It automatically re-sizes images, which is a bonus. It also supports text posts and is built for modern browsers with HTML5 and CSS3. When it comes to minimalism, single column themes stand out of the lot. The Wicked theme is such a 1-column theme but you can also change to multiple columns. Features offered include infinite scrolling or pagination, fully responsive layout, over 30 customization options, caption toggle on or off and other functional features. Fotogenik’s gapless and large tiles makes your Tumblr all about the photos. It is a responsive theme with features like social sharing, infinite scrolling, custom background and lightbox. 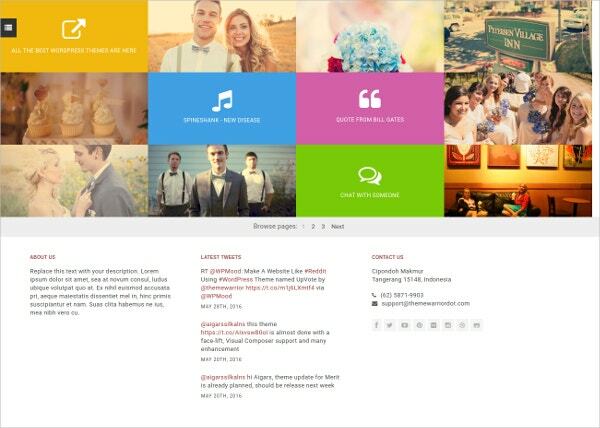 You can customize colors, background images, fonts and layout to suit your requirements. It gives you the choice of a left or right sidebar, allows Google Analytics and Disqus comments. Amanra is a responsive grid theme for Tumblr with a bright and quirky color palette. The theme supports all post types. It has a responsive layout and grid format with several customizable elements. Features include unlimited colors, Disqus comment, the latest Tweets and more. You can also add social media links and contact, toggle the hidden sidebar, post hover animation, floating social share etc. If you have a Tumblr chock full of content and want to organize them in an aesthetic grid layout, the Alchemist theme is for you. It gives you the flexibility to display posts at twice their size. Visitors can scroll into infinity and enjoy a fluid experience. Other features include customizable color options, logo uploads, Google web font, Twitter feed, Instagram feed, social icons, Dribble or Flickr feed and more. Makati is another minimalist theme with a grid layout. It uses bright refreshing colors contrasted with a neutral background, but you can also customize the colors as you like. The theme lets you toggle infinite scroll on, choose fewer columns to display, a series of Permalink changes and other useful features. 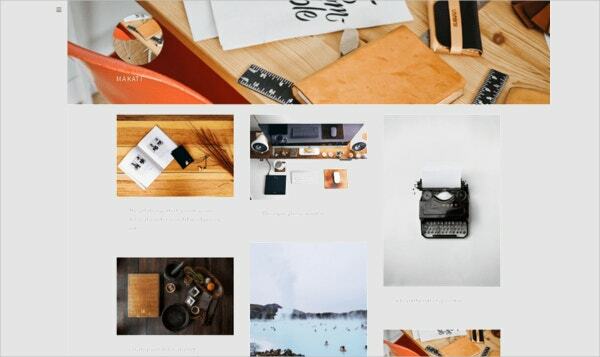 Wonder is an elegant and sleek photo gallery theme. The theme supports all post types, lets you select custom colors and custom header images etc. You can share, reblog and like posts from the homepage without having to open an individual box. You can use it to build a responsive website that looks great on mobiles. 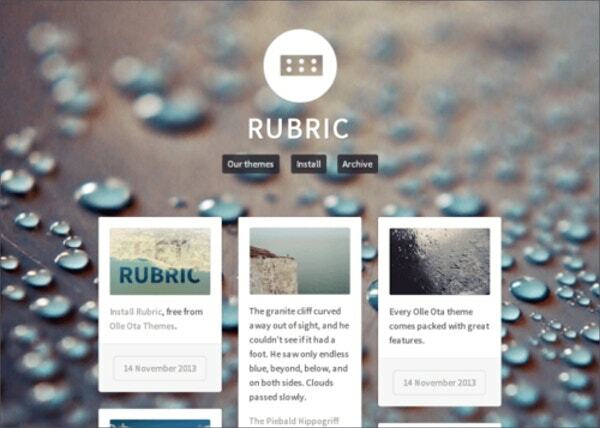 Rubric calls itself a “glossy” theme for Tumblr with a premium feel. 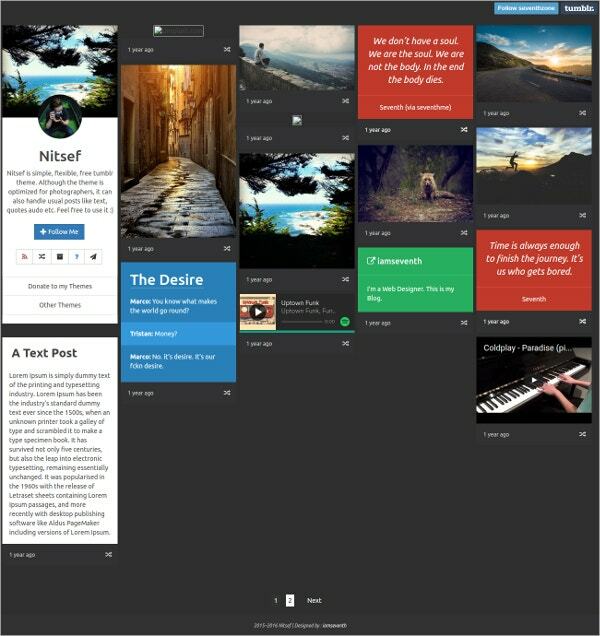 This free theme has a unique layout out of the box. You can change colors in the background and in the template. The image boxes on the home page have unique white borders and the total effect of the site is quirky yet polished. 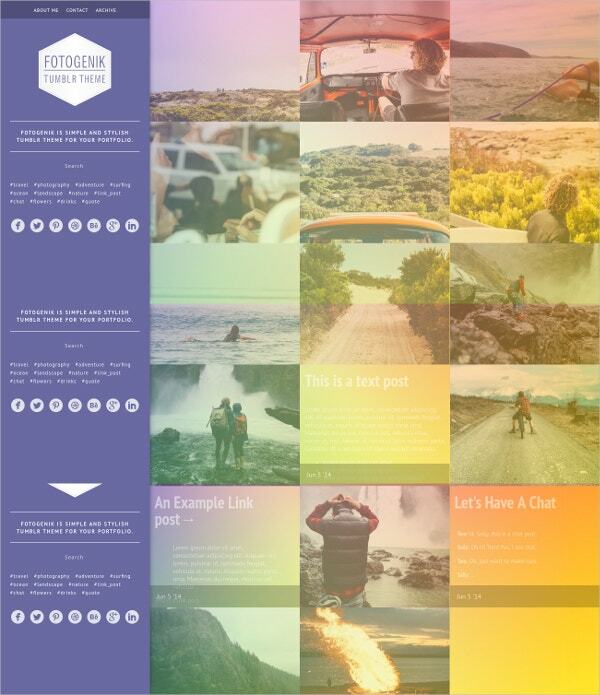 Use the beautiful demo images that come with the theme or upload your own. Overall, Tumblr Themes can make your Tumblr site look professionally put up, even without a big budget. 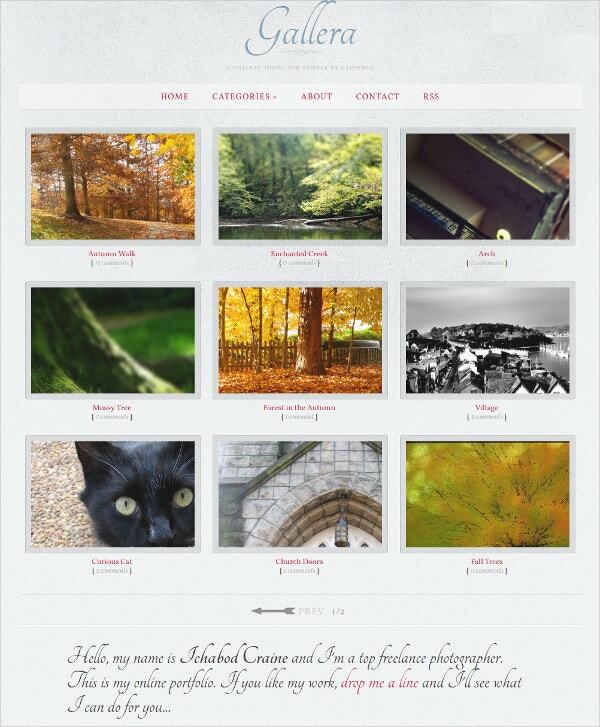 The free and premium Tumblr Templates listed here are best suited for showcasing photographs and image-heavy posts. All of these themes may be tailored to suit your needs, and all look great across multiple devices.